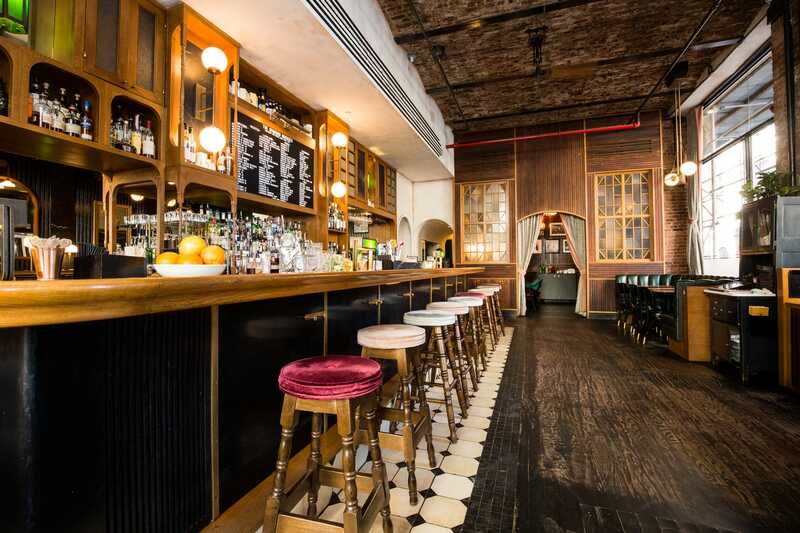 Sarah Jacobs/Business InsiderAdd these bars to your New York City bucket list. 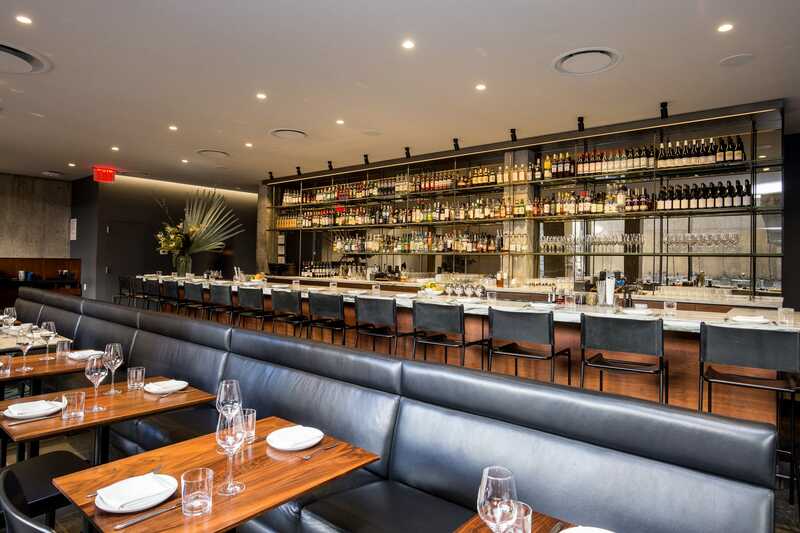 The Spaniard, Nobu Downtown, and Flora Bar all have unique interior decor and menu offerings. We visited each bar and compared them on design, menus, and overall aesthetic to determine a winner. Late last year Surface Magazine released its list of The Best Restaurant and Bar Designs of 2017 in the world. The list focuses on the architectural designs of the spaces, as well as the detail that went into their build. Three of the bars that made it onto the list are in Manhattan, in New York City, so we decided to check them out for ourselves. 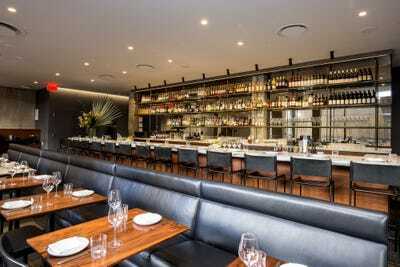 The Spaniard, Nobu Downtown, and Flora Bar all have a unique aesthetic and menu. 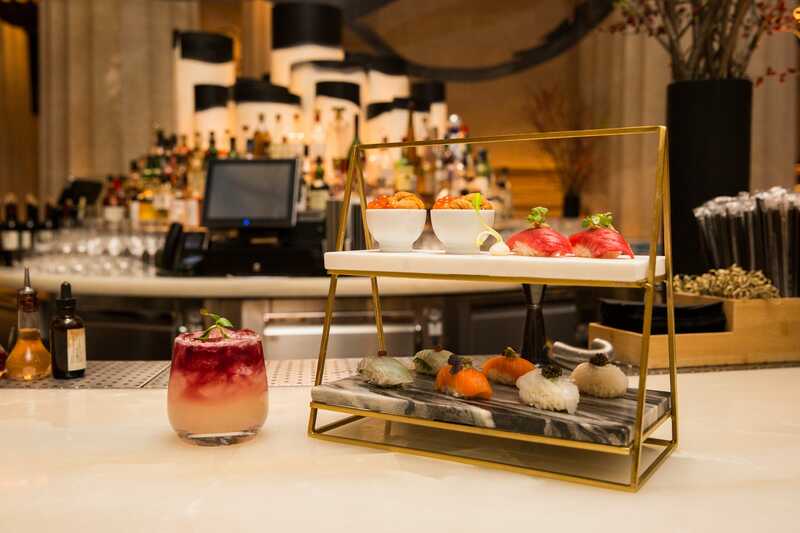 From tuna tartare, to patty melts, to yellowtail sushi these bars offer delicious bar food paired with a perfect cocktail – all within a beautifully designed space. 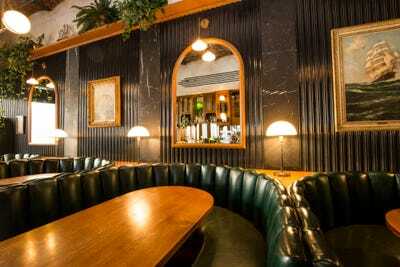 Inside Flora, you’re surrounded by bare concrete and served some of the best food in the city. 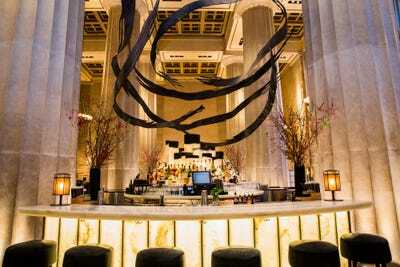 At Nobu Downtown, bar-goers sit below a massive wooden sculpture to enjoy cocktails. The Spaniard will leave you in awe of the incredible attention to detail. Below, a look inside the bars and which one we think is the clear winner. Flora Bar is nestled under the Met Breuer Museum — which focuses on modern and contemporary art — and serves brunch, lunch, and dinner, as well as coffee at an attached café. 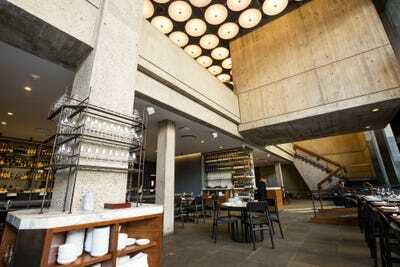 The building was named after its architect, Marcel Breuer, and housed The Whitney Museum for nearly 50 years. 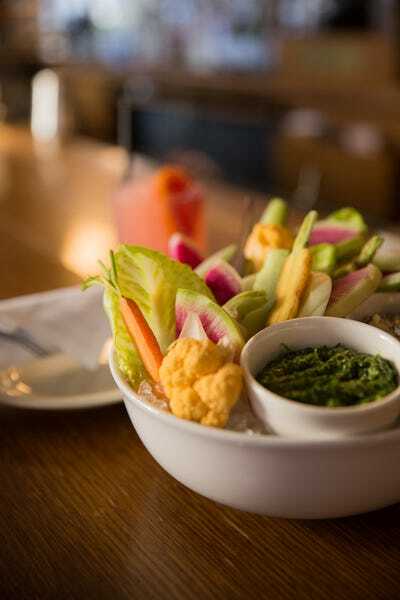 The Upper East Side restaurant was ranked No. 5 by The New York Times in their Top New York Restaurants of 2017 round up. 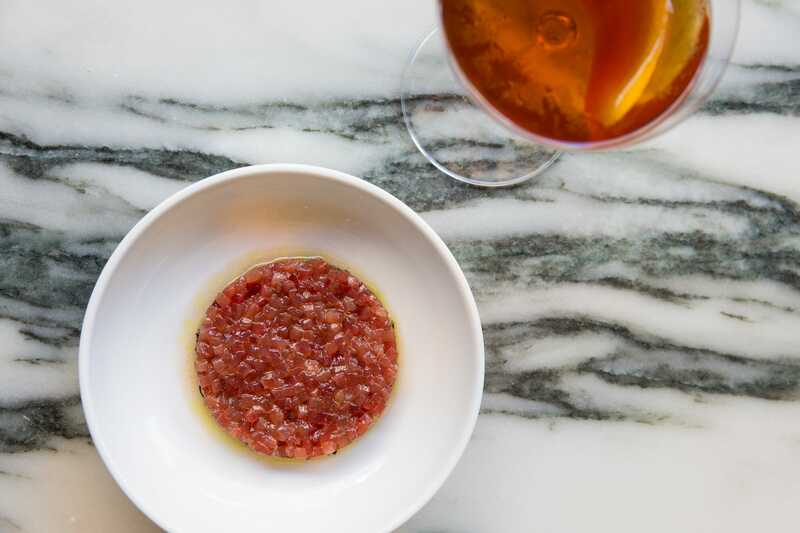 “A simple red disc on a white plate, Flora Bar’s tuna tartare isn’t like any I’ve had before; it pops with toasted flax seeds and crunches with fried shallots, neither of which hides the clean, cold taste of chopped yellowfin tuna,” New York Times food critic Pete Wells wrote in his review of Flora Bar. Sarah Jacobs/Business InsiderTuna tartare at Flora Bar. 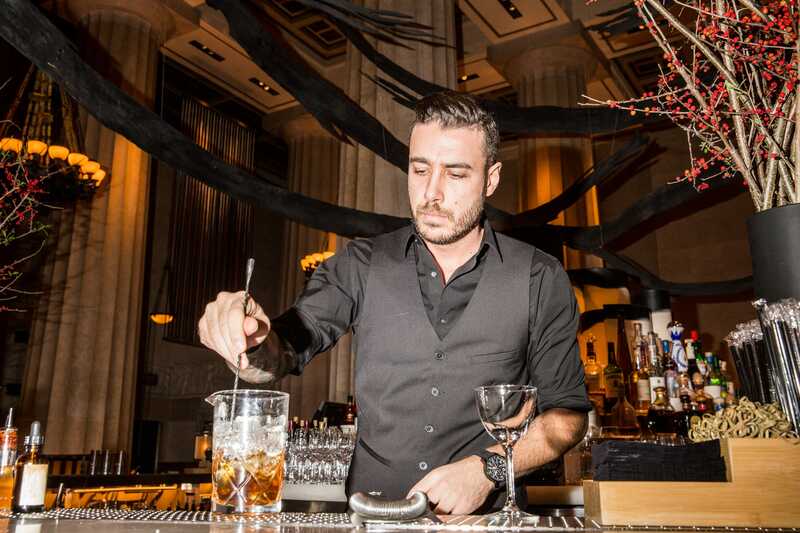 Cocktails, such as the Flamenco Sketches made with fino sherry and Dolin Blanc vermouth, run between $US15 and $US17. Sarah Jacobs/Business InsiderCocktail drinks at Flora Bar. Next up is Nobu Downtown in Manhattan’s Financial District. With 12,500 square feet of space, 4,500 of which is dedicated to the street-level bar, the bar can seat 16 people, while the surrounding lounge accommodates 76. The space, which sits inside the historic lobby of the original AT&T Building, was designed by David Rockwell and his firm Rockwell Group. 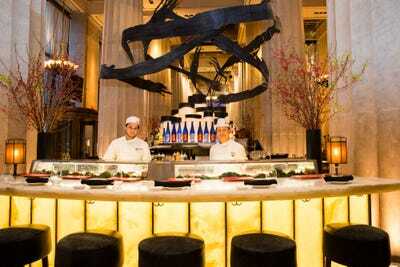 The team also designed the original Nobu in Tribeca. The wooden ash brushstroke sculpture that hangs above the bar was designed by the Rockwell Group, and hand carved by furniture maker John Houshmand. 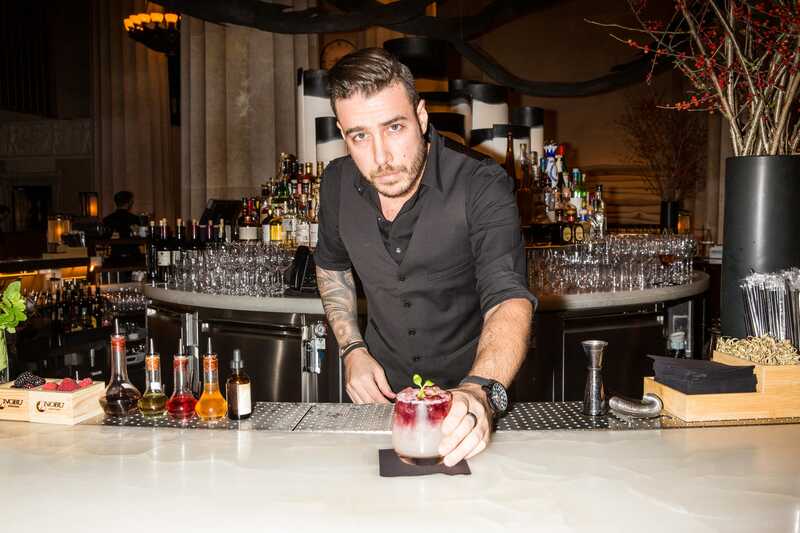 The bar at Nobu Downtown sits above the restaurant and offers an exclusive cocktail list, including the Mia Margarita, pictured here, and Nobu’s first-ever prix-fixe lunch that runs for $US35. Special drink ingredients include sesame-infused vermouth, a Nobu cabernet sauvignon float, and signature sake frescas. 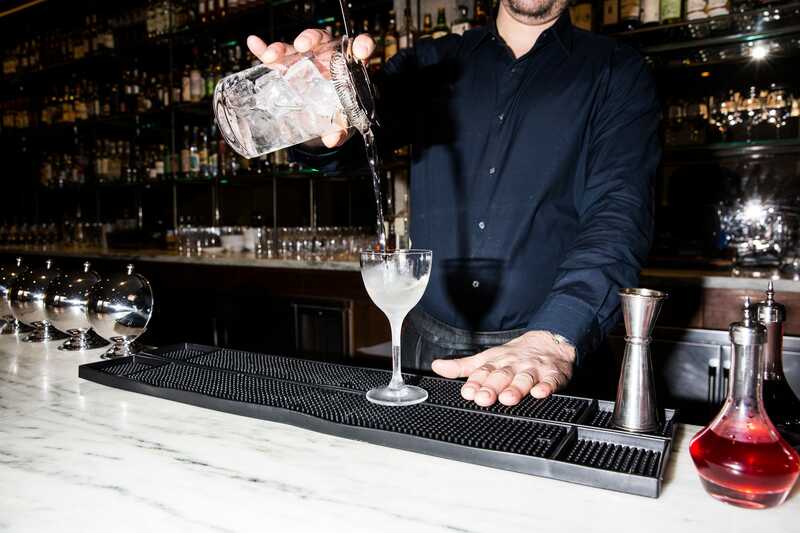 Cocktail prices range from $US16 to $US20. Over in the West Village, you’ll find The Spaniard, a bar designed by Brooklyn’s Home Studios, a design group that has had a hand in multiple watering holes across the city, including the Ace Hotels and Eataly. From the deep green leather booths to the velvet bar seats, the attention to detail inside The Spaniard does not go unnoticed. The menu was designed by chef PJ Calapa, a veteran of Nobu. The Spaniard’s menus — brunch, lunch, and dinner — focus on classic bar comfort foods, such as patty melts and onion rings, as well as some delightful surprises such as buffalo duck wings and steak tartare. 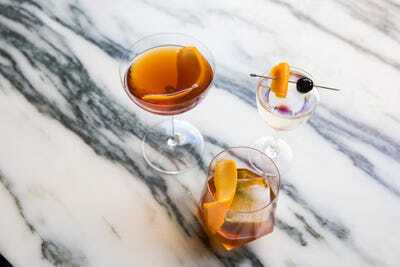 The cocktails, heavily in favour of whiskey ingredients, ranges in price between $US14 to $US16. With its “Critic’s Pick” seal of approval from New York Time’s food critic Pete Wells, and its stunning interior inside a building designed by Marcel Breue, one of the great masters of Modernism in the 20th century, Flora Bar is our winner. The interior’s brutalist style and large, sweeping windows creates an atmosphere like no other. Sarah Jacobs/Business InsiderBartender at Flora Bar.